Journalist Glenn Greenwald defends Assange: The Hill, Julia Manchester 24 Apr 19, ‘Things that journalists do every single day’ Journalist Glenn Greenwald on Monday defended WikiLeaks founder Julian Assange after he was charged by the Justice Department earlier this month for allegedly conspiring to hack a government computer in connection with the organization’s release of sensitive government files in 2010. “So much of what’s in the indictment, encouraging a source to get more documents, helping a source cover her tracks in order not to be detected, are things that journalists do every single day,” Greenwald, co-founding editor at The Intercept, told hosts Krystal Ball and Buck Sexton in an appearance on Hill.TV. The US news media devotes startlingly little time to climate change – how can newsrooms cover it in ways that will finally resonate with their audiences? This article is excerpted from a piece published by Columbia Journalism Reviewand the Nation. The Guardian is partnering with CJR and the Nation on a 30 April conference aimed at reframing the way journalists cover climate change.More information about the conference, including a link to RSVP, is here. When @mikebaird17 urged Hayes to invite Katharine Hayhoe of Texas Tech University, one of the best climate science communicators around, on to his show, she tweeted that All In had canceled on her twice – once when “I was literally in the studio w[ith] the earpiece in my ear” – and so she wouldn’t waste any more time on it. This spring Hayes redeemed himself, airing perhaps the best coverage on American television yet of the Green New Deal. All In devoted its entire 29 March broadcast to analyzing the congressional resolution, co-sponsored by Representative Alexandria Ocasio-Cortez and Senator Ed Markey, which outlines a plan to mobilize the United States to stave off climate disaster and, in the process, create millions of green jobs. In a shrewd answer to the ratings challenge, Hayes booked Ocasio-Cortez, the most charismatic US politician of the moment, for the entire hour. Yet at a time when civilization is accelerating toward disaster, climate silence continues to reign across the bulk of the US news media. Especially on television, where most Americans still get their news, the brutal demands of ratings and money work against adequate coverage of the biggest story of our time. Many newspapers, too, are failing the climate test. Last October, the scientists of the United Nations’ Intergovernmental Panel on Climate Change (IPCC) released a landmark report, warning that humanity had a mere 12 years to radically slash greenhouse gas emissions or face a calamitous future in which hundreds of millions of people worldwide would go hungry or homeless or worse. Only 22 of the 50 biggest newspapers in the United States covered that report. Instead of sleepwalking us toward disaster, the US news media need to remember their Paul Revere responsibilities – to awaken, inform and rouse the people to action. To that end, the Nation and CJR are launching Covering Climate Change: A New Playbook for a 1.5-Degree World, a project aimed at dramatically improving US media coverage of the climate crisis. When the IPCC scientists issued their 12-year warning, they said that limiting temperature rise to 1.5C would require radically transforming energy, agriculture, transportation, construction and other core sectors of the global economy. Our project is grounded in the conviction that the news sector must be transformed just as radically. The project will launch on 30 April with a conference at the Columbia Journalism School – a working forum where journalists will gather to start charting a new course. We envision this event as the beginning of a conversation that America’s journalists and news organizations must have with one another, as well as with the public we are supposed to be serving, about how to cover this rapidly uncoiling emergency. Judging by the climate coverage to date, most of the US news media still don’t grasp the seriousness of this issue. There is a runaway train racing toward us, and its name is climate change. That is not alarmism; it is scientific fact. We as a civilization urgently need to slow that train down and help as many people off the tracks as possible. It’s an enormous challenge, and if we don’t get it right, nothing else will matter. The US mainstream news media, unlike major news outlets in Europe and independent media in the US, have played a big part in getting it wrong for many years. It’s past time to make amends. Don’t blame the audience, and listen to the kids. The onus is on news organizations to craft the story in ways that will demand the attention of readers and viewers. The specifics of how to do this will vary depending on whether a given outlet works in text, radio, TV or some other medium and whether it is commercially or publicly funded, but the core challenge is the same. A majority of Americans are interested in climate change and want to hear what can be done about it. This is especially true of the younger people that news organizations covet as an audience. Even most young Republicans want climate action. And no one is speaking with more clarity now than Greta Thunberg, Alexandria Villaseñor and the other teenagers who have rallied hundreds of thousands of people into the streets worldwide for the School Strike 4 Climate demonstrations. Lose the Beltway mindset. …..
Don’t be afraid to point fingers. …. I’ve been told that Julian Assange is in favour of nuclear power – with the suggestion that we should not support him. Also that his revelations about Hilary Clinton helped to get the abominable Trump elected. But does this matter? Assange revealed the truth. And what will happen to the next whistlebower, perhaps one that reveals the corruption in the nuclear industry? 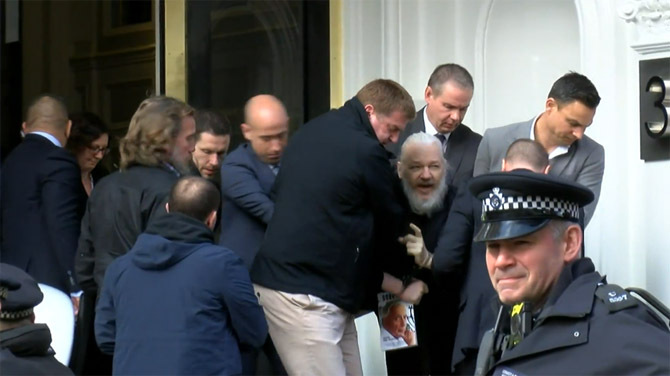 Whatever you think of Julian Assange, his extradition to the US must be opposed, Owen Jones, Guardian, 12 Apr 19, States that commit crimes in foreign lands depend on at least passive acquiescence. This is achieved in a number of ways. One is the “othering” of the victims: the stripping away of their humanity, because if you imagined them to be people like your own children or your neighbours, their suffering and deaths would be intolerable. Another approach is to portray opponents of foreign aggression as traitors, or in league with hostile powers. And another strategy is to cover up the consequences of foreign wars, to ensure that the populace is kept intentionally unaware of the acts committed in their name. This is what the attempted extradition of Julian Assange to the US is about. Back in 2010, the then US soldier Chelsea Manning downloaded hundreds of thousands of classified documents relating to US-led wars in Iraq and Afghanistan, US state department cables, and inmates imprisoned in Guantanamo Bay. Assange’s alleged role consists of helping Manning crack an encrypted password to gain access to the US defense department computer network. It is Manning who is the true hero of this story: last month, she was arrested for refusing to testify to a grand jury investigating WikiLeaks, placed in solitary confinement for four weeks, and now remains imprisoned. We must demand her freedom. These leaks revealed some of the horrors of the post-9/11 wars. One showed a US aircrew laughing after slaughtering a dozen innocent people, including two Iraqi employees of Reuters, after dishonestly alleging to have encountered a firefight. Other files revealed how US-led forces killedhundreds of civilians in Afghanistan, their deaths otherwise airbrushed out of existence. Another cable, which exposed corruption and scandals in the court of Zine al-Abidine Ben Ali, the western-backed then-dictator of Tunisia, helped fuel protests, which toppled him……..
Assange must answer the allegations of sexual assault in Sweden without the threat of extradition to the US………. That Swedish case must be entirely disentangled from the US extradition attempt. And while opposing Assange’s rightwing libertarian politics is perfectly reasonable, it is utterly irrelevant to the basic issue here of justice………. Assange’s extradition to the US must be passionately opposed. It is notable that Obama’s administration itself concluded that to prosecute Assange for publishing documents would gravely imperil press freedom. Yes, this is a defence of journalism and media freedom. But it is also about the attempt to intimidate those who expose crimes committed by the world’s last remaining superpower. The US wishes to hide its crimes so it can continue to commit them with impunity: that’s why, last month, Trump signed an executive order to cover up civilian deaths from drones, the use of which has hugely escalated in Afghanistan, Somalia, Yemen and Pakistan. What Does Julian Assange’s Arrest Mean for Journalists? The government likewise pursued a case in 2010 against former National Security Agency (NSA) senior executive Thomas Drake for leaking information about the NSA to The Baltimore Sun. Like Ellsberg, Drake was prosecuted under the Espionage Act—but again, the case was dropped and neither The Baltimore Sun nor the author of the piece were included in the case. What Does This Mean for Journalists? Wikileaks is undoubtedly a controversial group, which has been accused of abiding foreign nationals and participating in disinformation campaigns. But the organization is still a publisher, and Assange in 2010 was working to publish information. Inside a Nonprofit That Supports Environmental Journalists Around the World, Julia Travers , Inside Philanthropy, April 2019, Many countries, especially in the Global South, struggle to respond to environmental challenges like over-development, deforestation, poaching, pollution and climate change. When these threats are coupled with weak or corrupt government oversight, the news media—and robust, reliable local reporting—can be the only way to draw attention to what’s happening.Among the organizations and funders who support nonprofit journalism, the Earth Journalism Network (EJN) plays a unique role by empowering journalists from developing countries to cover local environmental beats effectively. Along with climate change, the writers it supports work on many intersecting issues like fossil fuel extraction and its effects, biodiversity, wildlife trafficking and more. Philanthropy upped its journalism game as print news declined and continues to invest in this area as both verbal and violent attacks on the media increase. The Omidyar Network, Democracy Fund and the Knight, MacArthur, International Women’s Media and Ford foundations and others have all contributed substantially to causes like bolstering investigative reporting and local news, combating disinformation, and ensuring safety for reporters. Environmental journalism is one area that’s drawn rising support in recent years, and we’ve written before about the growth of outlets like Grist and InsideClimate News. EJN is different from these publications—operating as a network that provides grants, training and more—but it’s also expanded its reach as funders have grown more concerned about environmental threats. Ianfairlie 8th March 2019 On March 8, the BBC published a news item about cracks in the Hunterston B nuclear reactors. Whilst it is good that the story highlighted reporting of the safety issues surrounding the plant and, in particular, included photographs of the cracked graphite core, we wish to correct several inaccuracies. The BBC article claims that early decommissioning could cause serious energy supply problems. This is simply not the case and is alarmist nonsense: the reality is that Scotland has, if anything, an oversupply of electricity. Both Hunterston and Torness could be closed without problem to Scotland’s electricity supplies. The BBC article then states that “Concerns have also been raised about the consequences for local jobs if Hunterston closed early.”As pointed out in our article, few if any jobs would be lost if the reactors Hunterston B were closed permanently: dealing with the immense heat rates from radioactive decay even from closed reactors will guarantee jobs there for the first 2 to 3 years. After that decommissioning will provide more jobs then when the reactors operated, just as is occurring at the closed reactors at Dounreay. The BBC cites Councillor Tom Marshall as stating: “Most of the large employers round about here have disappeared – and this is one of the last major employers. Hunterston B for good will not lead to large numbers of job losses: the contrary in fact. The video — with the clickbait title “What They Haven’t Told You about Climate Change” — has been watched more than 2.5 million times on the Google-owned video platform. Produced by the conservative group PragerU, the video sees Canadian lobbyist and fossil fuels advocate Patrick Moore run through a long-debunked argument that because the world’s climate has changed before, there’s no problem with burning record amounts of fossil fuels. Moore claims, for example, there has been “no significant warming trend” in the 21st century — not mentioning that nine of the 10 warmest years on record have occurred since 2005, or that the world’s oceans have been heating rapidly. Despite the clear errors, the video has gathered more views than any other climate science denial clip on YouTube. All up, PragerU claims the video has been watched 4.4 million times across all platforms. A search on YouTube for the most viewed “climate change” videos has Moore’s effort ranked 13th — searching for “global warming” has it ranked 19th. But where the problems really start, are when YouTube’s “up next” algorithm takes a guess at what you might want to watch next after seeing Moore’s video. When I viewed YouTube without signing in, almost all the videos suggested by the algorithm would sit firmly in the climate science denial folder. There’s so much of this material on YouTube that it’s not hard to find once the algorithm opens the door. Then there are two other videos, both titled “The Truth About Global Warming,” and both delivering the opposite to what its title claims. For an unsuspecting viewer, watching just one video can lead you quickly into an alternate universe where facts, physics, and real-world experiences are replaced by conspiracies, cherry-picking, and fossil fuel–backed propaganda. Google refuses to blur nuclear facilities on Google Maps http://www.brusselstimes.com/rss-feed/14011/google-refuses-to-blur-nuclear-facilities-on-google-maps, Alan Hope, 08 February 2019 Internet search giant Google has rejected a request from the Belgian nuclear power regulator to blur out its satellite images of the country’s nuclear power stations for security reasons. Google will respond positively to requests from private individuals to blur their homes in its Street View mode, and it routinely blurs the faces of people in the streets and car number plates. But when the Federal Agency for Nuclear Control, together with the federal home affairs ministry, approached Google with a request to blur the satellite pictures of nuclear plants Google refused. For the FANC, the risk is real, particularly the risk of terrorist attacks. The photo shown is a magnification intended to fill the frame with the Doel nuclear power plant; much closer magnification at a high degree of definition is possible with an ordinary laptop. The latest satellite images available for the location date from 2019, so are the best currently available. The image can also be viewed in 3D and dragged to give a full tour of the site. The same applies to the plant at Tihange. Seeking refuge in its political horse race roots, NBC (and others) meanwhile report the story of war as one of Rumsfeld vs. the Generals, as Wolfowitz vs. Shinseki, as the CIA vs. Cheney, as the bad torturers vs. the more refined, about numbers of troops and number of deaths, and even then Obama vs. the Congress, poor Obama who couldn’t close Guantanamo or reduce nuclear weapons or stand up to Putin because it was just so difficult. We have contributed to turning the world national security into this sort of political story. I find it disheartening that we do not report the failures of the generals and national security leaders. I find it shocking that we essentially condone continued American bumbling in the Middle East and now Africa through our ho-hum reporting……….. Journalists describe some of the threats and dangers they faced in 2018. These range from intimidation to legal threats to outright violence. At least 10 journalists covering the environment were killed between 2010 and 2016, according to Reporters without Borders — all but two of them in Asia. A pair of “French spies” had infiltrated India by sea to commit a “treasonous conspiracy,” an Indian minister claimed in late November. In reality, they were two visiting journalists, and their mission was an investigation into allegations of illegal sand mining in the southern state of Tamil Nadu. They had merely tried and failed to visit the site of a major mining company through legal means. Their presence set off alarm bells among some connected to the industry, and the fallout has been significant. It’s included a police investigation, a politically fueled propaganda campaign, and the arrests of two local translators who had been working for them. This heavy-handed response is familiar to Indian journalist Sandhya Ravishankar, who has reported on sand mining since 2013 and found that her probing into allegations of major business interests damaging the local environment has resulted in stalking and various types of harassment – some of it reportedly directed by the head of one of the mining companies. Ravishankar’s case is just one example of the growing dangers for journalists reporting environmental stories. Even as environmental journalism becomes increasingly important in the face of destructive business and political interests and practices, the inherent safety risks remain. There are also the more routine challenges of accessing crucial information and convincing editors and readers of their importance. “Journalists I’ve interviewed have been arrested, sued, fired, threatened, harassed, interrogated by police, interrogated by the military, physically assaulted and a number of them have been killed while covering logging, mining, development,” said journalism professor Eric Freedman in an interview. Freedman is the Knight Chair in Environmental Journalism and director of the Knight Center for Environmental Journalism at Michigan State University. Freedman said environmental journalism came with its own set of challenges, many of which evolve with the story. “Environmental controversies frequently involve power, political and economic power,” he said. “They involve money, whether mines or fracking or hydropower. The made-for-TV movie The Day After had an enormous impact on America’s national conversation about nuclear weapons in 1983. Resuming that conversation today is essential, and the movie holds some lessons about what that would take. The Nation, By Dawn Stover– 14 Dec 18 This article originally appeared as part of a special section on The Day After at the Bulletin of the Atomic Scientists “…….The television movie The Day After depicted a full-scale nuclear war and its impacts on people living in and around Kansas City. It became something of a community project in picturesque Lawrence, 40 miles west of Kansas City, where much of the movie was filmed. Thousands of local residents—including students and faculty from the University of Kansas—were recruited as extras for the movie; about 65 of the 80 speaking parts were cast locally. The use of locals was intentional, because the moviemakers wanted to show the grim consequences of a nuclear war for real Middle Americans, living in the real middle of the country. By the time the movie ends, almost all of the main characters are dead or dying. ABC broadcast The Day After on November 20, 1983, with no commercial breaks during the final hour. More than 100 million people saw it—nearly two-thirds of the total viewing audience. It remains one of the most-watched television programs of all time. Brandon Stoddard, then-president of ABC’s motion picture division, called it “the most important movie we’ve ever done.” The Washington Post later described it as “a profound TV moment.” It was arguably the most effective public-service announcement in history. It was also a turning point for foreign policy. Thirty-five years ago, the United States and the Soviet Union were in a nuclear arms race that had taken them to the brink of war. The Day After was a piercing wake-up shriek, not just for the general public but also for then-President Ronald Reagan. Shortly after he saw the film, Reagan gave a speech saying that he, too, had a dream: that nuclear weapons would be “banished from the face of the Earth.” A few years later, Reagan and Soviet leader Mikhail Gorbachev signed the Intermediate-Range Nuclear Forces (INF) Treaty, the first agreement that provided for the elimination of an entire category of nuclear weapons. By the late 1990s, American and Russian leaders had created a stable, treaty-based arms-control infrastructure and expected it to continue improving over time. Now, however, a long era of nuclear restraint appears to be nearing an end. Tensions between the United States and Russia have risen to levels not seen in decades. . Alleging treaty violations by Russia, the White House has announced plans to withdraw from the INF Treaty. Both countries are moving forward with the enormously expensive refurbishment of old and development of new nuclear weapons—a process euphemized as “nuclear modernization.” Leaders on both sides have made inflammatory statements, and no serious negotiations have taken place in recent years. There are striking parallels between the security situations today and 35 years ago, with one major discordance: Today, nuclear weapons are seldom a front-burner concern, largely being forgotten, underestimated, or ignored by the American public. The United States desperately needs a fresh national conversation about the born-again nuclear-arms race—a conversation loud enough to catch the attention of the White House and the Kremlin and lead to resumed dialogue. A look back at The Day After and the role played by ordinary citizens in a small Midwestern city shows how the risk of nuclear war took center stage in 1983, and what it would take for that to happen again in 2018. In one scene in The Day After, a pregnant woman who has taken shelter in the Lawrence hospital along with fallout victims tells her doctor that her overdue baby doesn’t want to be born. You’re holding back hope, he says. Radiation Free Lakeland 2nd Dec 2018 Is it OK to have Radiocaesium and Transuranics in a Childrens Play Area on the Beach? Last thursday Radiation Free Lakeland were invited to Cleator Moor Civic Hall for the West Cumbria Site Stakeholder meeting (Environment and Health). We have deliberately shunned these meetings thinking that they are PR exercises for the industry. The meetings are billed as a way of holding the industry and regulators to account but our experience on thursday confirmed our suspicions. We were invited to the meeting to make a presentation on our citizen science project with nuclear science students in the US. We had been sending samples to the US from the whole of the Cumbrian coast for over a year. The US undergraduate student’s findings shocked us. A full third of the samples taken were contaminated with material that can only have come from decades of Sellafield’s reprocessing. There are not enough people holding the nuclear industry to account. That much is clear. The plan revealed from Sellafield is that they intend to reduce the beach monitoring and retrieval of radioactive particles even further to a nominal “reassurance” monitoring. Indeed, we could see those articles as pivotal in the current hostile environment against Assange; the purpose of which is presumably to prepare the way for the extradition of Assange to the US. Meanwhile, the Mueller inquiry into alleged links between US president Donald Trump and Russia – and Assange – is gaining headlines on an almost daily basis. And there is evidence that Assange has been secretly indicted and that an extradition request is imminent. Former diplomat challenges ‘fake’ Guardian claims about Julian Assange meeting Paul Manafort The Canary Tom Coburg 3rd December 2018 A former consul and first secretary at the Ecuadorian Embassy in London has spoken out against a “fake story” from the Guardian. Speaking to The Canary, Fidel Narváez insisted that the claim that former Trump campaign manager Paul Manafort met with WikiLeaks founder Julian Assange is entirely false. The Canary has also seen a copy of correspondence to the Guardian from the same diplomat. In these, he makes a formal complaint, accusing the newspaper of fabricating an earlier story about a Russian plot to smuggle Assange to Russia.The Manafort claim The Canary previously reported on criticisms from WikiLeaks and others which stressed that Guardian claims about Manafort meeting Assange in 2013, 2015 and March 2016 were false. WikiLeaks said it was preparing to sue the Guardian on the matter. And Manafort is also considering legal action, saying this story is “totally false and deliberately libellous”. It is impossible for any visitor to enter the embassy without going through very strict protocols and leaving a clear record: obtaining written approval from the ambassador, registering with security personnel, and leaving a copy of ID. The embassy is the most surveilled on Earth; not only are there cameras positioned on neighbouring buildings recording every visitor, but inside the building every movement is recorded with CCTV cameras, 24/7. In fact, security personnel have always spied on Julian and his visitors. It is simply not possible that Manafort visited the embassy. This story relied on a number of sources. We put these allegations to both Paul Manafort and Julian Assange’s representatives prior to publication. Neither responded to deny the visits taking place. We have since updated the story to reflect their denials. Prior to the Guardian publishing the article, however, WikiLeaks did deny that the visits took place. It did that via a tweet in response to an email to Assange’s lawyers from one of the journalists who authored the article, saying how the Guardian was planning to run the story. The first published version of the article did not contain this WikiLeaksdenial. There is another Guardian story by the same authors that Narváez also disputes. On 21 September 2018, the Guardian claimed there was a plan to smuggle Assange from the Ecuadorian Embassy via a diplomatic vehicle, and from there to Russia. But according to the article, the plan was called off after UK authorities refused to recognise that Assange was due diplomatic protection. The Guardian also referred to an alternative plan that would have seen Assange transported to Ecuador………….. There are all sorts of internecine battles being waged inside the Ecuadorian Government that provide motive to feed false claims about Assange to the Guardian. Senain, the Ecuadorian intelligence service that the Guardian says showed it the incriminating report, has been furious with Assange for years, ever since WikiLeaks published files relating to the agency’s hacking and malware efforts. Narváez is accusing the Guardian of multiple fabrications. This is made worse by the fact that the articles in question were subsequently reproduced by numerous media outlets. Luke Harding and Dan Collyns, the authors of the Manafort fake story, are the same ones who wrote the Russia smuggling plot fake story, and their ‘sources’ are most probably the same. I find it incredible that the Guardian allows these people to repeatedly damage the paper’s credibility and reputation. On November 10, Los Angeles Magazine ran an article claiming there was no risk related to SSFL contamination from the Woolsey fire that we now know actually began on the SSFL property itself. Below is our response. There is no need to put quotes around “significantly contaminated” – SSFL is one of the most contaminated sites in the nation, subject of a promised but long-delayed state and federal cleanup; it is heavily contaminated with well documented nuclear and chemical contamination, from, among other things, a partial nuclear meltdown. The claim in the first hours of the fire by DTSC, an agency that has no public confidence to the point that the state legislature commissioned an Independent Review Panel to investigate its failings (which include the Exide fiasco in Vernon,) that it didn’t “believe” there was a risk is cover for its failure to live up to its cleanup commitments (it had promised the site would be cleaned up by 2017 and the cleanup hasn’t even begun). It is pure conjecture. DTSC does not have have any scientific data to back up the claim. It based the spurious assertion on its claim that the fire in its first hours was not in areas where contamination could be released, but the state fire department now shows almost all of the contaminated site as within the fire boundary. Given the extent of contamination in the site’s soil and vegetation, it is indeed possible and likely that contamination from the site was spread further from the fire in smoke, dust, and ash. The bottom line is it irresponsible to claim that SSFL contamination was not spread further by the fire. Los Angeles Magazine may wish to read its own cover story from 1998: HOT ZONE – Rocketdyne’s Santa Susana Field Laboratory was on the front lines of the Cold War. Now some who lived near “The Hill” say they share two distinctions: chronic illness and the unswerving belief that the lab caused it.